The French Corner: Let's Roll the Dice! Here's a fun and simple activity to review ER verb conjugations (or any verb conjugations for that matter) without having to use English. I adapted this from various games I have seen my colleagues and others doing in their classrooms. Before I describe this activity, I want to point out that this is to me a scaffolding activity. I would consider my teaching approach to be communication-based, but sometimes non-communicative activities like this are important to build a foundation to communicate from. I did this activity a couple days after students learned about the different verb forms (a future post will highlight story I used to introduce them this year). Put students in small groups (this is important when the material is still new). Have each group make a grid of A-F across and 1-6 up and down (see below). Give each group a number dice and a letter dice. On the board at the front of the room, have a picture to represent 6 different pronouns for each letter A-F (for example, a picture of a person pointing to himself to represent "je" next to the letter A, a picture of Uncle Sam to represent "tu" next to the letter B, and so on). Then, have a picture to represent 6 different verbs next to each number. 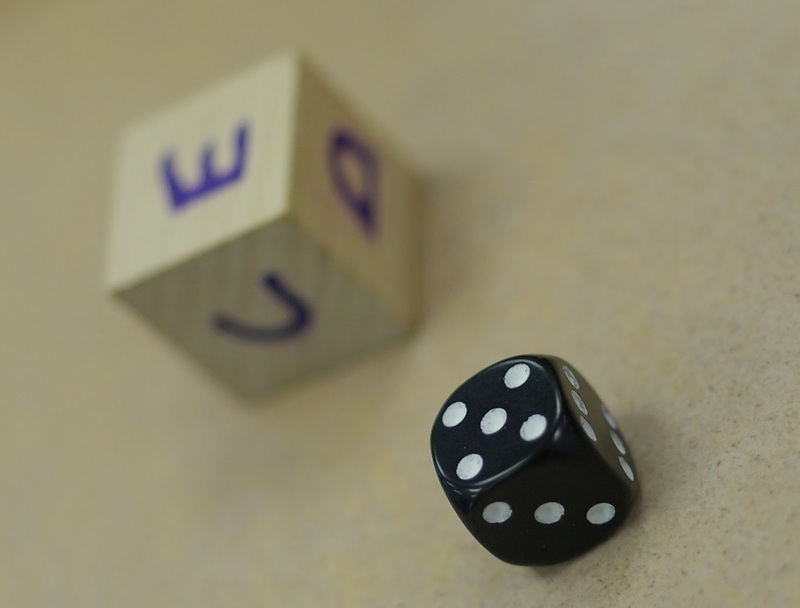 In groups, students roll the dice and write on a white board the verb form that corresponds to the two pictures. Then, they call either me or one of the volunteer checkers circulating the room (who have answer keys) to verify that it's correct. The checker can only say "Oui" or "Non." If it's incorrect, though, they can keep trying. If it's correct, they put an X or a 1 on the spot on the grid. Ideally, the students won't need to speak any English during this activity. They can say what ending is needed in French. At the end of the activity, the group with the highest number of Xs earns a prize. You can also have students compete against each other in the group (initialing instead of X-ing in the grid), but I like to have the students work together. This is a pretty simple activity, but the students really enjoy doing it! Have you ever done an activity like this? How was yours different? I've done something similar but with tic tac toe boards and another version with connect four. I've done this in partners competing against each other. Each person gets a different color marker. The color takes the place of Xs and Os. The numbers on the die represent a subject pronoun or if we're working on articles a type liked masculine singular. Using their markers they write in a square the correct form of the verb or article. I like your version where they speak the form though.